Microsoft just release the first Semi-Annual Channel release for System Center, called System Center, version 1801. This is the first release which now comes out to support the Windows Server Semi-Annual Channel releases like 1709 and also brings some new features and performance improvements. System Center, version 1801 is the first of our Semi-Annual Channel releases delivering new capabilities at a faster cadence. Semi-Annual Channel releases have an 18-month support policy. In addition, we will continue to release in the Long-Term Servicing Channel (LTSC) at a lower frequency. The LTSC will continue to provide 5 years of mainstream support followed by 5 more years of extended support. What’s in System Center, version 1801? System Center, version 1801 focuses on enhancements and features for System Center Operations Manager, Virtual Machine Manager, and Data Protection Manager. Additionally, security and bug fixes, as well as support for TLS 1.2, are available for all System Center components including Orchestrator, Service Management Automation, and Service Manager. Support for additional Windows Server features in Virtual Machine Manager: Customers can now setup nested virtualization, software load balancer configuration, and storage QoS configuration and policy, as well as migrate VMware UEFI VM to Hyper-V VM. In addition to supporting Windows Server, version 1709, we have added support for host monitoring, host management, fall back HGS, configuration of encrypted SDN virtual network, Shielded Linux VMs on Hyper-V management, and backup capabilities. Linux monitoring in Operations Manager: Linux monitoring has been significantly improved with the addition of a customizable FluentD-based Linux agent. Linux log file monitoring is now on par with that of Windows Server (Yes, we heard you! Kick the tires, it really works). Improved web console experience in Operations Manager: The System Center Operations Manager web console is now built on HTML5 for a better experience and support across browsers. Updates and recommendations for third-party Management Packs: System Center Operations Manager has been extended to support the discovery and update of third-party MPs. Faster, cost-effective VMware backup: Using our Modern Backup Storage technology in Data Protection Manager, customers can backup VMware VMs faster and cut storage costs by up to 50%. And much more including Linux Kerberos support and improved UI responsiveness when dealing with many management packs in Operations Manager. In Virtual Machine Manager, we have enabled SLB guest cluster floating IP support, added Storage QoS at VMM cloud, added Storage QoS extended to SAN storage, enabled Remote to VMs in Enhanced Session mode, added seamless update of non-domain host agent, and made host Refresher up to 10X faster. You can get System Center, version 1801 from the Evaluation Center or the Volume Licensing Service Center. I am happy to announce and remind you that I will be speaking at the Experts Live Cafe in Bern this Friday. The Experts Live Cafe is a Swiss IT Pro Meetup run by the Microsoft MVPs Stefan Johner and Stefan Roth. Experts Live is a non-profit organization that has a mission to enable sharing of knowledge and experience about Microsoft technologies worldwide. The ExpertsLive Cafes are user group meetups which are designed to bring IT professionals closer together. I will be covering one of two sessions about this months Experts Live Cafe and talk about Windows Server. In Fall 2017 Microsoft has updated Windows Server to the next Semi-Annual Channel release with new features and improvements and Microsoft will now release new SAC and LTSC releases. Join this session for the best of Windows Server, learn how the new Servicing Model of Windows Server works and what does it mean to use SAC or LTSC releases, and what new improvement and features Microsoft offers in the latest releases such as 1709 and 1803. You’ll get an overview about the new, exciting improvements that are in Windows Server and how they’ll improve your day-to-day job. There should be still some free seats, so hopefully see you there! Microsoft yesterday announced the general availability of PowerShell Core 6.0. 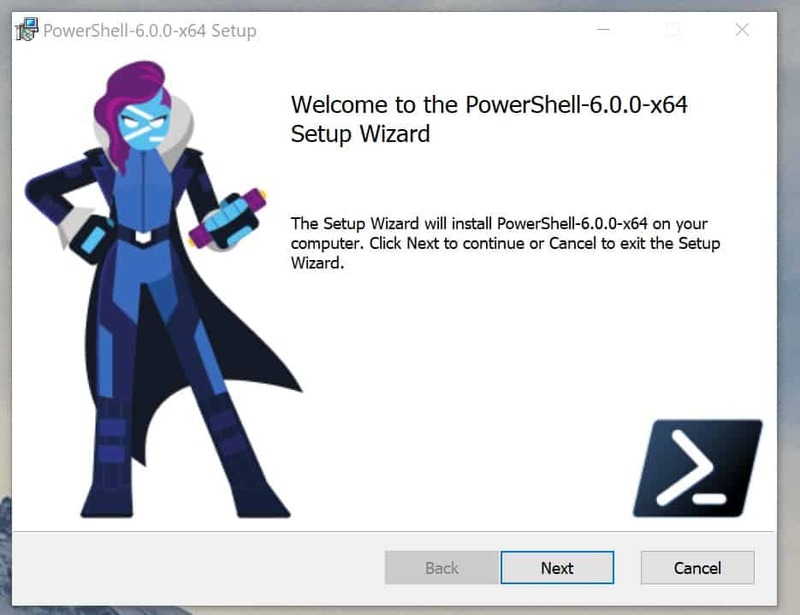 PowerShell Core 6.0 is a new edition of PowerShell that is cross-platform (Windows, macOS, and Linux), open-source, and built for heterogeneous environments and the hybrid cloud. PowerShell Core uses .NET Core 2.0 as its runtime. PowerShell Core also exposes the API set offered by .NET Core 2.0 to be used in PowerShell cmdlets and scripts. 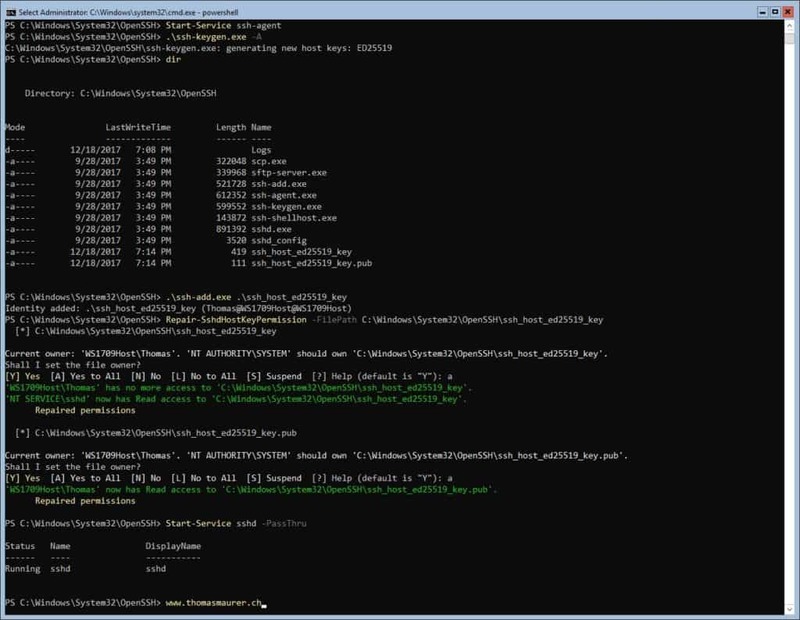 Quote: PowerShell Team Blog: PowerShell Core 6.0: Generally Available (GA) and Supported! In this blog post I tried to quickly summarize the information and link it to the right websites. Microsoft is aware of detailed information that has been published about a new class of vulnerabilities referred to as speculative execution side-channel attacks. This industry-wide attack method takes advantage of out-of-order execution on many modern microprocessors and is not restricted to a single chip, hardware manufacturer, or software vendor. To be fully protected, updates are required at many layers of the computing stack and include software and hardware/firmware updates. Microsoft has collaborated closely with industry partners to develop and test mitigations to help provide protections for our customers. At the time of publication, Microsoft had not received any information to indicate that these vulnerabilities have been used to attack our customers. Note This issue also affects other operating systems, such as Android, Chrome, iOS, and MacOS. Microsoft addressed protect against speculative execution side-channel vulnerabilities in the latest Windows Updates. However, customers who only install the Windows January 2018 security updates will not receive the benefit of all known protections against the vulnerabilities. In addition to installing the January security updates, a processor microcode, or firmware, update is required. This should be available through your device manufacturer. Surface customers will receive a microcode update via Windows update. Verify that you are running a supported antivirus application before you install OS or firmware updates. Contact the antivirus software vendor for compatibility information. Apply all available Windows operating system updates, including the January 2018 Windows security updates. Windows-based machines (physical or virtual) should install the Microsoft security updates that were released on January 3, 2018. See Microsoft Security Advisory ADV180002 for updates for the following versions of Windows. Apply the Windows operating system update. For details on how to enable this update, see Microsoft Knowledge Base Article 4072699. Make necessary configuration changes to enable protection. Apply an applicable firmware update from the OEM device manufacturer. Windows Servers-based machines (physical or virtual) should get the Windows security updates that were released on January 3, 2018, and are available from Windows Update. For physical hosts or virtual machines that are running untrusted code such as containers or untrusted extensions for database, untrusted web content or workloads that run code that is provided from external sources. There for Microsoft posted some additional registry keys to mitigations on servers. Microsoft also added some extra registry keys if you are running older versions of Hyper-V. Ensure guest virtual machines have access to the updated firmware. By default, virtual machines with a VM version below 8.0 will not have access to updated firmware capabilities required to mitigate CVE-2017-5715. Because VM version 8.0 is only available starting with Windows Server 2016, users of Windows Server 2012 R2 or earlier must modify a specific registry value on all machines in their cluster. Perform a cold boot of guest virtual machines.Virtual machines will not see the updated firmware capabilities until they go through a cold boot. This means the running VMs must completely power off before starting again. Rebooting from inside the guest operating system is not sufficient. Update the guest operating system as required. See guidance for Windows Server. The updates will be available for the above devices running Windows 10 Creators Update (OS version 15063) and Windows 10 Fall Creators Update (OS version 16299). You will be able to receive these updates through Windows Update or by visiting the Microsoft Download Center. Microsoft has already deployed mitigations across the majority of our cloud services and is accelerating efforts to complete the remainder. However, I always recommend that you also patch your operating systems and applications to be protected against other vulnerabilities. Microsoft is not aware of any attacks on the Microsoft Cloud customers which leverage these types of vulnerabilities. Microsoft employs a variety of detection capabilities to quickly respond to any malicious activity in our enterprise cloud services. Most of the Azure infrastructure has already received mitigations against this class of vulnerability. An accelerated reboot is occurring for any remaining hosts. Customers can check the Azure Portal for additional details. All other enterprise cloud services such as Office 365, Dynamics 365, and Enterprise Mobility + Security have mitigations against these types of vulnerabilities. Microsoft engineering is continuing to perform analysis across the environments to confirm further protection. Apply Azure Stack 1712 update. See the Azure Stack 1712 update release notes for instructions about how to apply this update to your Azure Stack integrated system. Install firmware updates from your Azure Stack OEM vendor after the Azure Stack 1712 update installation is completed. Refer to your OEM vendor website to download and apply the updates. Some variations of these vulnerabilities apply also to the virtual machines (VMs) that are running in the tenant space. 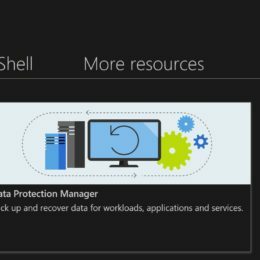 Customers should continue to apply security best practices for their VM images, and apply all available operating system updates to the VM images that are running on Azure Stack. Contact the vendor of your operating systems for updates and instructions, as necessary. For Windows VM customers, guidance has now been published and is available in this Security Update Guide. IA64-based versions of SQL Server 2008 are not believed to be affected. Microsoft made a list of different SQL Server scenarios depending on the environment that SQL Server is running in and what functionality is being used. Microsoft recommends that you deploy fixes by using normal procedures to validate new binaries before deploying them to production environments. 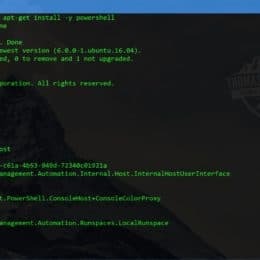 The Microsoft Security Response Center released a PowerShell Module on the PowerShell Gallery called SpeculationControl, which verifies if your system is protected or not. A couple of weeks ago I already wrote about how OpenSSH is now available on Windows 10. 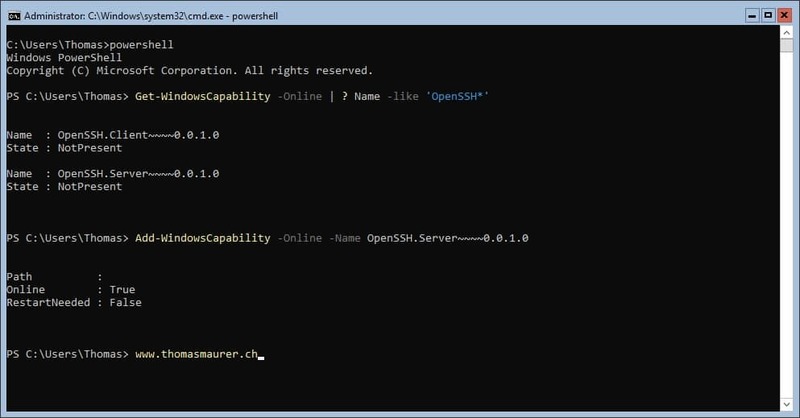 In this blog post I will cover how to install and configure OpenSSH Server on Windows 10 and Windows Server 1709. Today, OpenSSH Client and Server on Windows are still in Beta, so they should only be used in secure test environments and not in production. First you have to install the OpenSSH feature on your Windows machine. Remember that it needs to be the Windows 10 Fall Creators Update (1709) or Windows Server version 1709 or higher. # Install the OpenSSHUtils helper module, which is needed to fix the ACL for ths host keys. On Windows 10 you can also use the UI to install it. To enable authentication into an SSH server on Windows, you first have to generate host keys and repair the ACL on the host keys. 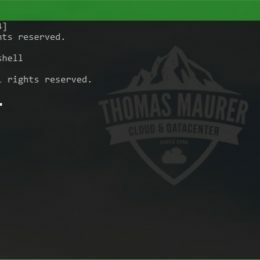 Now you should be able to connect to the Windows Machine using SSH for an SSH client. Of course this can be the OpenSSH client or the SSH client which comes with the Windows Subsystem for Linux on Windows 10. If you are running OpenSSH Server on a Windows 10 or Windows Server 1709 virtual machine in Microsoft Azure, don’t forget to also configure the Network Security Group (NSG) to allow SSH inbound access on port 22. 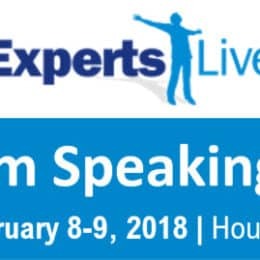 I am happy and proud that I will speak at next years Experts Live US 2018 in Houston. This will be the first Experts Live Conference in the United States taking place from February 8 – 9 2018. I am happy to present at this event, and be part of the Experts Live journey over the globe, where I have been able to speak at Experts Live in Europe, Asia and Australia. Microsoft released Azure Stack as a Azure appliance for your datacenter. Learn what Azure Stack is, what challenges it solves, how you deploy, manage and operate a Azure Stack in your datacenter. Learn about the features and services you will get by offering Azure Stack to your customers and how you can build a true Hybrid Cloud experience. In this presentation Thomas Maurer (Microsoft MVP) will guide you through the highly anticipated innovations and experience during the Azure Stack Early Adaption Program and Azure Stack Technology Adoption Program (TAP). A little less than one year ago Microsoft released Windows Server 2016. In Fall 2017 Microsoft has updated Windows Server to the next Semi-Annual Channel release with new features and improvements and Microsoft will now release new SAC and LTSC releases. Join this session for the best of Windows Server, learn how the new Servicing Model of Windows Server works and what does it mean to use SAC or LTSC releases, and what new improvement and features Microsoft offers in the latest releases such as 1709 and 1803. You’ll get an overview about the new, exciting improvements that are in Windows Server and how they’ll improve your day-to-day job. 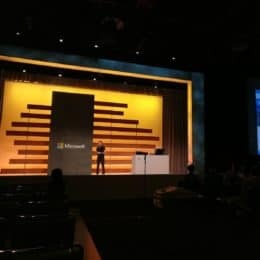 In this presentation Thomas Maurer (Microsoft MVP) will guide you through the highly anticipated innovations including: · Windows Server Containers · Hyper-V features · Nano Server · Storage · Networking · Security · Windows Server Containers And more! 10 hidden Hyper-V features you should know about! In this session Thomas Maurer will talk about 10 hidden Hyper-V features everyone should know about. This covers different features for Hyper-V on Windows Server as well as on Windows 10. I will also be part of the AMA (Ask me Anything) Discusison Panel: Hybrid Cloud , together with my friends John Joyner (Microsoft MVP) and Janaka Rangama (Microsoft MVP). Bring your questions on Azure Stack, Windows 2016, Hyper-V and Disaster Recovery in this “ask me anything (AMA) panel discussion. Hope fully I see you in Houston at Experts Live US 2018! Today I am happy to announce that I have the honor to speak at HPE Discover in Madrid next week. In a presentation together with HP Enterprise I will talk about how HPE and Microsoft improve the Hybrid Cloud experience using Microsoft Azure Stack. With the release of Azure Stack, now is the time to develop your hybrid cloud business. Hewlett Packard Enterprise and Microsoft have partnered to make it easy for you to accelerate your business by offering Azure-consistent services with HPE ProLiant for Microsoft Azure Stack. Come hear about HPE’s solution for Azure Stack and how HPE can help you develop and grow your Azure business. This session is designed for HPE partners. I hope to see you next week in Madrid, if you have the chance, step by the HIAG Data booth and ask for me.